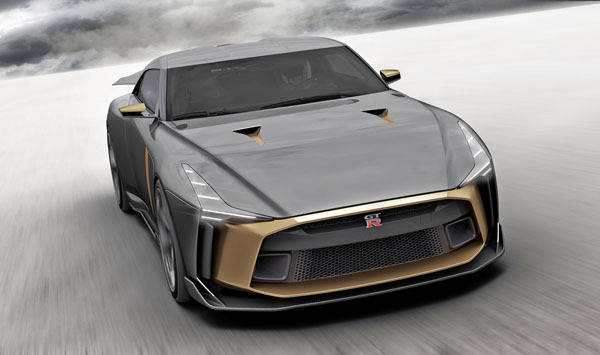 The Nissan GT-R50 by Italdesign has made its world debut at the Goodwood Festival of Speed. 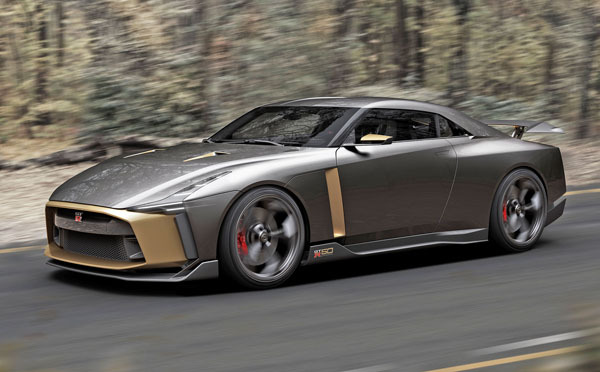 The first-ever collaboration between Nissan and Italdesign, the GT-R50 prototype could become the blueprint for an extremely limited run of hand-built production vehicles. Nissan GT-R50 by Italdesign commemorates the 50th anniversaries of both the Nissan GT-R, in 2019, and Italdesign, in 2018. 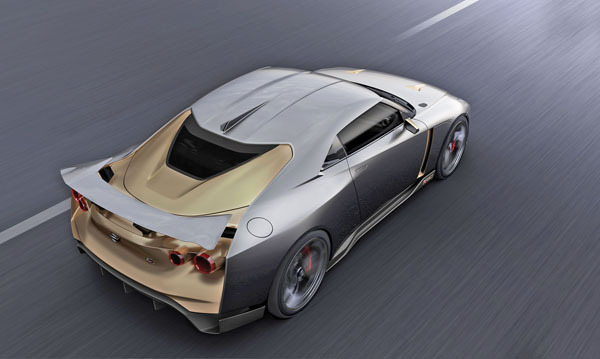 Based on Nissan’s latest GT-R NISMO it combines Japanese brute force with Italian craftsmanship. Key design features include a pronounced power bulge on the bonnet, stretched LED headlights, a lowered roofline, and prominent “samurai blade” cooling outlets behind the front wheels. A large, adjustable rear wing, mounted with two uprights dominates the rear. The body is finished in a Liquid Kinetic Gray colour, with distinctive Energetic Sigma Gold anniversary accents. The seats are trimmed in Alcantara and fine black Italian leather. Two different carbon fibre finishes are used on the centre console, instrument panel and door linings. Gold accents echo the exterior treatment throughout the cockpit. Power comes from a hand-assembled 3.8-litre V6 VR38DETT engine to produce an estimated 720 horsepower and 780 Nm of torque. For serious inquiries about obtaining a Nissan GT-R50 by Italdesign visit www.gt-r50.nissan/.